Onota Brook may look like a quiet, country stream now, but, throughout much of the nineteenth century, the water flowing in its fast moving current powered hundreds of textile machines, operated by close to a thousand workers who annually produced tons of wool and cotton fabric. The first industry to harness the water power on Onota Brook was not connected with textiles at all, but was an iron forge owned by John Seymour. The early iron forges used the water source to power the large bellows to fan the intense heat needed, and then to drive the hammer that flattened and shaped the iron. The new technologies to clean, spin and wind cotton and wool fueled such a demand that entrepreneurs across New England looked for sites to set up new factories. Two such entrepreneurs were Elijah and Jabez Peck, brothers who started a tin manufacturing firm in 1828. In 1844, Elijah Peck bought out the water privileges from Seymour for his first building housing a cotton warp mill that made yarn from cotton fibers for sale to other factories weaving the cloth. This structure was located just west of the junction of Peck’s Road and Onota Street. Within a year, Peck’s brother Jabez had joined the enterprise and gradually expanded the operations. The new company, J. & E. Peck Manufacturing, continued to grow with new buildings and dwellings for the 75 employees working in his cotton factory before the Civil War. By 1853, both brothers had transferred ownership to the next generation, Jabez L. Peck, who changed the name of the company to J.L. Peck. The younger Peck had his eyes on another forge further upstream operated by Aaron Hechot and bought it out during the Civil War. His decision to expand may have been driven by the drying up of cotton supplies as a result of the war, but he was also certainly aware of new competition from the Russell brothers building a woolen mill just downstream from his cotton operations. The large, 2-story brick mill and became known as the Upper Mill, in contrast to the Lower Mill which still produced cotton. 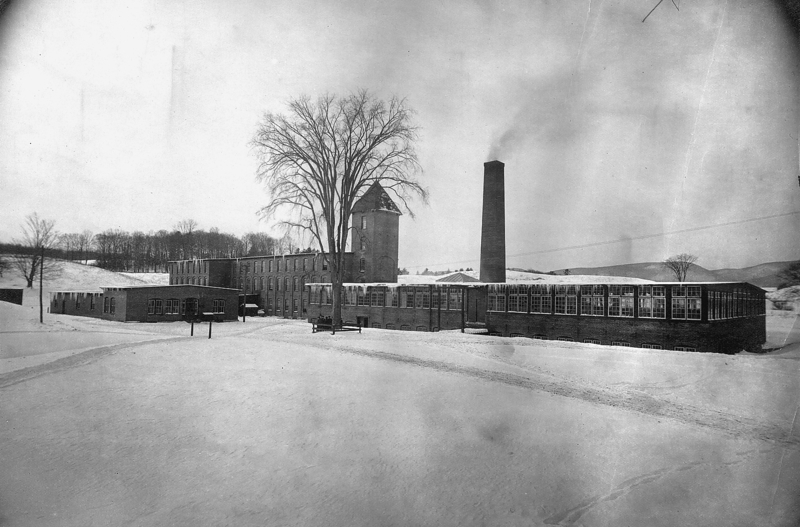 Peck had little time to recoup his large investment in the new mill before he had to contend with a fire which gutted his cotton warp factory in 1866. Two years later, though, he had added a new 2-story wood frame building to his lower mill for cotton and continued to expand adding dye-houses, storage boiler rooms for steam powered to supplement water as the energy source for the two mills. At its height, the company with both mills employed over 300 men, women and children who operated carding machines, narrow and broad looms and thousands of spindles to wind the thread produced. Jabez L. Peck continued running the business well into his 90s, but was succeeded by his son Thomas after he died in 1895 at the age of 96. The mill continued in operation until 1910 when it closed. Within a year, a new company was organized, Berkshire Woolen and Worsted, that bought the complex and brought in new equipment and expanded the workforce to 450. Berkshire Woolen continued to operate until 1960 when competition from synthetic fibers and southern mills forced it to close. Today, only Peck’s Upper Mill still stands, at the corner of Valentine and Pecks Roads, along with several of the dwellings that were built to house the workers along Peck’s Road and at the end of Onota Street.